How can start-ups create content that engages their followers on social media? The medium is the answer. To an extent. In early 2017, Ignite, a social media marketing agency that helped create the social media marketing industry over ten years ago, conducted a survey to understand what works and what doesn’t work on Facebook. Ignite studied more than 18,000 posts from 30 brands from January 1st 2015-December 31st 2016. They found one consistent trend: video works. To an extent. In other words, don’t make a video simply because you think you should make one. While video typically reaches the largest percentage of followers, it’s not inherently the best medium to get your audience engaged. Overall, photo posts get the most engagement, followed by links, then video. Which makes sense, since in today’s busy world, it takes less time to view a photo than something that’s a few minutes long. Only make a video if it’s the best medium for your company’s message. Don’t do what Michael Dell did in this video. Looks like something a suburban Dad made in his basement in the 90s. If Michael Dell wanted to introduce dellideastorm.com to the world, perhaps it would have been better to have a video that presented the reader with the website’s interface. Even just a link to the website (like this one) would have been better than 90s Dad in his basement. Here’s how to do video the right way. Dollar Shave Club was just one-year-old in March 2012 when they released this video. It’s funny, snarky, straightforward, and not what you’d expect from a razor commercial. This video went viral, and then Dollar Shave Club ran out of inventory within 6 hours. The start-up’s revenue was $4 million at the end of 2012 and it more than doubled by the end of 2014. In 2016, Unilever purchased Dollar Shave Club for $1 billion. It may not be your business’s end goal to get bought out, but videos done right can work wonders! You don’t always need a big marketing budget or an over-produced video to pull that off though. Remember Blendtec? It’s the blender that’s destroyed everything from a Rubik’s Cube to an iPhone. The unknown company started off with two guys, $50 and a bright idea. The founder, Tom Dickson, used to test the durability of his blenders by jamming various objects into it. One day, his marketing director saw this and had a thought. Why not catch this all on camera? So he went out and bought a few different objects and a white lab coat for Tom to wear. For their first video, Tom put fifty glass marbles into one of their blenders. When the smoke cleared, all that poured out of the glass was dust and the viewers were left with one impression: “Blendtec can blend anything.” This 30 second clip racked up 6 million views in a week and within two years, the ‘Will It Blend?’ campaign helped Blendtec grow by over 700%. If you want to learn more about content and social marketing, AdWeek articles are a great place to start! 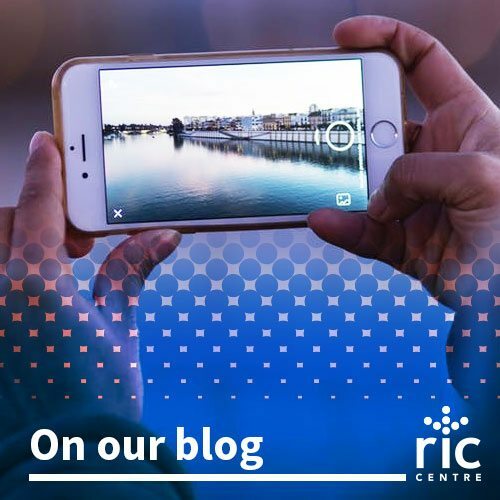 And if you want to learn more about marketing for start-ups, check out the RIC Centre’s blog!